← A Very Odd Manicure and Winnie Little. Bish – fish. We’re having trouble with Fs. 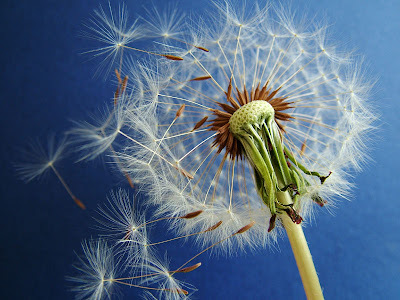 Fuffs – the dandelion clock flower thingies that you blow all the seeds from. Very cute. Mumeh – What was previously “mimi” and should be “Mummy” is now pronounced in the broadest Bolton accent EVER! NnnnnnnnnnnAMarrrrrr! – Grandma. Mostly said with a huge build up and emphasis on the “AM” sound in the middle. Spashy – Splashy. This particular noun covers puddles, running taps, baths, showers, and deliberately upturned drinks in order to manufacture her own puddle. Bye Bye – Self explanatory but essential when leaving anyone or anything behind. Yesterday at the park “Bye bye Spashy” was spluttered out amidst floods of tears when I removed her from a puddle after 20 minutes or so of splashing. Leaving the house typically involves the following diatribe: “Bye bye Fizz, bye bye Gabbar”, (Fizz and badger – the dogs) “bye bye bish, bye bye cat, bye bye book, bye bye stowbee, bye bye Daddy.” In that order! Bye bye is also used when she wants me to go away, with accompanying wave. Erriot – Her friend Elliot. We are also having trouble with the letter L.
Pump – The bodily function of flatulence – whenever it occurs – must apparently be announced to whoever may be in earshot, loudly and immediately. Boobiiieeeees! – A current obsession with Mummy’s busters. So like her Dad in so many ways . . .
Bic Bic? – The question mark is here as this is usually a request, made whilst staring up at me with big blue eyes and pointing innocently to the biscuit tin. This is probably the only thing on the list I dread hearing. A positive response makes for a very happy little Giblet. A “No” is the beginning of the end of the world. Down! Sty! Seet! – Down! stay! sit! A veritable Barbara Woodhouse, but disappointingly, the dogs have yet to pay any attention to these heartfelt commands. EAT YOUR HEART OUT TUMBLE! HA! I’ve no doubt that the second I publish this post I’ll think of a whole lot more, but that’ll do for now. In the mean time, keep on blathering baby girl – you’re doing great!